Brittle Bush lighting up shorelines Monday at Lake Pleasant. ROOSEVELT LAKE — (2,123 feet, 68-percent full). Water temperatures high-60s during afternoons. Bass are being caught in shallow depths throughout Roosevelt and Apache Lakes. Even San Carlos, on the reservation is producing excellent bass and crappie results. Bass are in pre, post and spawning phases which means many are feeding heavily and anglers are reporting catch and release of up to twenty fish per day. The water flows into Roosevelt Lake from the Salt River and the Tonto Creek have slowed considerably recently and are now below normal flow rates for this time of year. The water level currently stands at 68% full and the water clarity is improving. The recent winds are keeping conditions from being perfect for sight fishing, however, moving water caused by those winds, improves the reaction bait bite. The water temperature is reaching the high 60’s during the afternoons which is ideal for both bass and crappie spawning. Many bass are located in as little as 2 feet deep water and are being caught on a variety of baits. Crank-baits, jerk-baits and spinner-baits have all been reported as effective. Translucent colored Roboworms and Senko worms using a drop-shot technique will catch a large number of bass. The full moon on April 10th will bring another big wave of bass to the shallow flats for the spawn, so look for good overall bass fishing conditions for the next couple of months. Crappie anglers are reporting less than ideal sight fishing conditions due to the wind. A local team reported catching 50 crappie on a recent trip to San Carlos with all but a few of them in less than 3 feet of water. Also, most of the crappie being caught in shallow water are male which are distinguishable during the spawn by the gloss black color with emerald green spots. This would indicate that the female crappie are still a week or so from moving shallow for the spawn. The crappie spawn on Roosevelt Lake is probably still a few weeks away when the water temperature maintains the 65 degree level. LAKE PLEASANT – (Lake elevation 1,696 feet, 94 % full). Water temperatures have been in the mid-60s by Wednesday afternoon. Stripers being caught are full of eggs and caught at an average water depth of 30-45 feet. Try the northern coves this time of the year. Live shad remains a go-to bait for striper fishing. Water visibility is limited in the northern coves but clear in open water. Largemouth bass anglers can throw jerkbaita and small crankbaits in the back of northern coves or fish dropshot-rigged plastic worms on points (some anglers have reported success after dark). It’s particularly important to pay attention to wind direction at Pleasant — wind from the south means plankton and baitfish will be pushed into the northern coves, where your predatory fish are more likely to be feeding. A diver reported that heavy winds and ensuing current destroyed some grassy habitat and so many bass have moved off their beds. Motorized access to the upper arm of the Agua Fria River at Lake Pleasant via Table Mesa Rd. will again be available thanks to a special development project of the Arizona Game and Fish Department’s Boating Access Program. Through the cooperative efforts of the Department, the Maricopa County Parks and Recreation Department and the U.S. Bureau of Reclamation, this unique boating and fishing opportunity will be available each Friday through Sunday throughout the spring, beginning Friday, March 24. Operating hours are from 6:00 a.m. to 5:00 p.m., and regular park entry fees apply (exact change required). See more information. BARTLETT LAKE – Lake elevation is 1,796 feet, feet, 97 % full. Bartlett Lake is full and the water is clearing up. Bass fishing is good in 2-12 feet from the dam to the river using crankbaits, spinner baits (white or chartreuse) and baby brush hogs (watermelon red). Texas-rigs worms aren’t producing as much as the brush hogs. Bass are all phases of spawn. COMMUNITY FISHING WATERS — Channel catfish are back in core Community waters. See the stocking schedule through the summer. SAGUARO LAKE – The lake is 1,523 feet (93-percent full). CANYON LAKE – Lake level is 1,658 feet (98-percent full.) The final rainbow trout stockings of the winter season took place a month ago. Fishing likely is pretty difficult – but Canyon is the land of lunkers when it comes to bass. For better numbers, try Bartlett or Saguaro. APACHE LAKE – Lake elevation is 1,912 feet (95-percent full). Spinners have been successful with smallmouth bass. Crankbaits and jigs also have been effective. Try reaction baits in the morning and during afternoons, jigs or dropshots. Not a bad time to drift along and throw crankbaits or spiinnerbaits. Apache Lake’s final schedule trout stocking of the winter season was a month ago. HORSESHOE LAKE – Lake elevation is 2,022 feet (92-percent full). When the lake is full, there are a lot of spawning fish. LOWER SALT RIVER – On Wednesday morning the river was flowing at 10 cfs out of Stewart Mountain. Is being stocked with trout this week and next week. No new reports of success. Jim Goughnour of Rim Country Custom Rods previously reported Trout fishing in Rim Country streams is also being called excellent. The water levels are still higher than usual due to run-off from the snow melt. Experienced fly anglers are recommending using a dual fly set-up with a small weight and an indicator. LAKE MEAD — Ed caught a nice smallmouth bass on using a tube bait. These baits come in a variety of colors so you can mimic what the bass are feeding at the time. The bite is getting hotter on both Mead and Lake Mohave. Jack caught a monster 48-pound, 13-ounce striper in about 10 feet of water in the flats across from South Cove. He also caught another lunker on the fishing trip. For more information, go to the Arizona Game and Fish Department’s web pages at azgfd.gov or visit http://100thmeridian.org/. LAKE MEAD – The current elevation is 1089 feet above msl. The National Park Service has been working to improve conditions at South Cove launch ramp, and latest report is that 4×4 is not needed to launch/retrieve boats. Be sure to check out launch ramp area prior to launching. Be careful boating because of low water level, many new islands and near surface rocks have appeared. The largemouth bass bite is slowing with the cold weather. Night crawlers were the bait for the channel catfish. The striper bite is steady on Lake Mead. Fishing the boils with top water baits is probably your best type of lure. Cut anchovies are still the bait of choice for stripers when anchored at night. Check the moon phases before you go –the last new moon was January 27th. The next new moon will be February 26th. Dark nights work best when fishing under light. Fishing for stripers in 40 plus feet of water will normally find the larger fish. If they are not taking the anchovies try lures and see if you can get them to bite. If you can locate the shad, the stripers are not far behind. Trolling usually works best in areas where shad are found and best done in the early mornings and evenings. LAKE MOHAVE – The lake level is currently 643 feet above msl. The fishing dock at Katherine’s Landing can produced some nice fish. The striper bite has returned according to reports. Down deep by the dam and above the power lines are reported as the hottest spots. Lures that mimic trout are working for stripers as well as the old tried and true anchovies. Submersible lights fished during the new moon are an effective way to catch stripers. Check the moon phases before you go – the last new moon was January 27th. The next new moon will be February 26th. Cut anchovies usually work the best for stripers at night. WILLOW BEACH – Try spinner baits along with cut anchovies for stripers. Trout are scheduled to be stocked the first week of February. If you fish Willow beach and are having luck, please e-mail me at gcummins@azgfd.gov so I can share your successes with others. TOPOCK GORGE – Use swim baits and pencil poppers if anchovies aren’t working. Stripers are being taken and are ranging between 1-4 pounds. TOPOCK MARSH – The marsh will be closed until March 6th due to U. S. Fish and Wildlife Service management actions. For more information on the marsh, contact the Havasu National Wildlife Refuge at (760) 326-3853 or go to http://www.fws.gov/southwest/refuges/arizona/havasu/index.html. DEAD HORSE RANCH STATE PARK – Trout were stocked the week of February 6th and are tentatively scheduled for the week of March 6th. Bring a variety of baits just in case the fish aren’t biting. Try small spinners or spoons, Powerbait, night crawlers or any other bait. Bass bite has slowed. If you fish Dead Horse please e-mail me at gcummins@azgfd.gov so I can share your successes with others. VERDE RIVER (throughout Verde Valley) – Trout were last stocked the week of February 6th and are tentatively scheduled for the week of February 27th. The smallmouth bass and catfish bite has dropped to poor but the bass that are caught are on the small side and you can keep all you catch. Bring a variety of bait so you can change if the bite is absent. FAIN LAKE — Park is open and fish were stocked February 13th and are tentatively scheduled for the week of March 6th. Reports are that the fish are biting but bring a variety of bait. 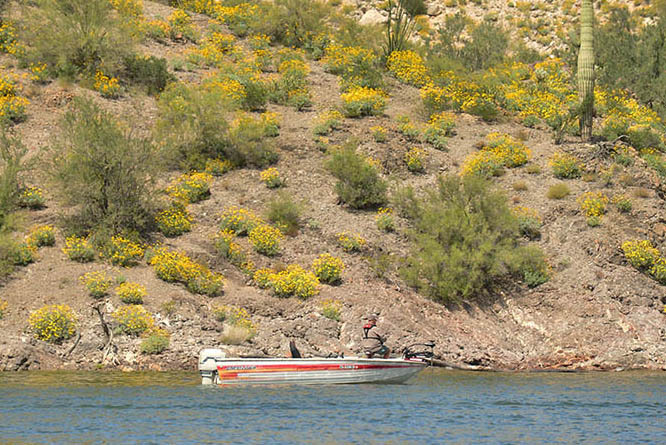 GOLDWATER LAKE — Goldwater was stocked the week of February 6th. The next stocking is tentatively scheduled for the week of March 6th. Try several colors of power bait and power eggs and if you don’t get bites try night crawlers or small spinners. They are a great option if you are not getting bites with other baits. Jonathan reports that he has success using orange and yellow power bait eggs on about a 12 to 18 inch leader. Small spinners work very well also. Michael reports that 1½ inch Crappie Tubes & Acme Castmasters lures work very well on the trout. This is the second time he has reported method in the last couple weeks. GRANITE BASIN LAKE – Bite has been slow to nonexistent with the cold water and air. If you fish Granite Basin Lake and are having luck, please e-mail me at gcummins@azgfd.gov so I can share your successes with others. LYNX LAKE – The latest rainbow trout stocking was January 30th. Catchable Brown Trout were stocked September 6th and catfish were stocked the week of September 22nd. Change baits if you are not having any luck and move down the shore a few hundred feet. Rob reports that the morning bite is best and limits can be caught in the 20 degree air temps. Later in the morning the trout move to the 14-35 feet in depth. Try yellow colored power bait or power eggs for trout if the spinners don’t work. The gold colored Super Duper is a distant second. Night crawlers are always good bait that can work on most fish. MINGUS LAKE – Trout were last stocked the week of October 17th. The best bait is white or pink Powerbait, fished under a bobber or a spinner with a silver blade are doing well. The gate will be locked soon, with an anticipated mid-December locking. The lake is iced over according to reports so be careful if you fish there. WATSON – Trout were stocked January 9th and again on January 30th. Bring night crawlers if your other baits are not working. Michael, using 1.5 inch crappie tubes, reports large rainbow trout that are putting up a great fight. WILLOW CREEK RESERVOIR – No recent reports. If you fish Willow and are having luck, please e-mail me at gcummins@azgfd.gov so I can share your successes with others. All of the lakes are full. Since all of the lakes are full this year we don’t have enough trout to stock all of the lakes (if you don’t stock enough fish in a lake folks can’t catch them). This year we are only planning on stocking Kaibab Lake and Dogtown Lake with Rainbow Trout. As soon as the lakes stop spilling we will start stocking Kaibab and Dogtown. We do plan on stocking Channel Catfish in City Reservoir in the late Spring, but we don’t have a date set. Dogtown Lake has not been stocked yet, but will be soon. Fishing has been slow, but the few holdover fish being caught are nice size fish. 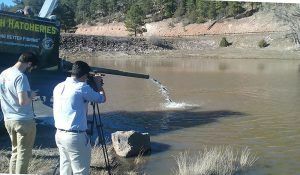 About 3,200 Rainbow Trout were stocked in Kaibab last week. The lake is still muddy so fishing is probably slow. I would try small silver or gold lures to try and catch the Trout. Ashurst is full!! The road is open and the first load of 2,700 Rainbow Trout was stocked last week. Another 3,000 were stocked on Monday. The water in the lake is relatively clear so I would try fishing with lures for the fresh stockers. With the low water level of the lake prior to the spring runoff I don’t think many fish survived the winter. So far Frances Short pond has been stocked with about 1,000 Rainbow Trout with more scheduled to be stocked this week. Folks have been catching fish using flies and lures. Some have also been caught using corn and worms. The load of Trout stocked last week contained some larger fish with some being over 14 inches. Stocked Thursday. The gate will be open weekends (Saturday and Sunday) from 7:30 a.m.-5:30 p.m. Lower Lake Mary has had about 22,000 larger (10 + inch) Rainbow Trout stocked in the last couple of weeks along with about 8,600 smaller (6-8 inch) Rainbow Trout. The recent stocking of Rainbow Trout contained some really nice trout with one being measured at about 18 inches. My coworker caught and released 102 trout Tuesday on flies with a size 12 bead head prince nymph and size 12 zebra midge working best. Folks were also doing well on small lures. Blueridge Reservoir (CC Cragin) will not be stocked this year. We will be stocking Knoll Lake, Huffer Tank and Mormon Lodge Pond later on in the year. Fishing is good at Concho Lake, Silver Creek, Becker Lake, Big Lake, Carnero Lake, and River Reservoir. Concho Lake is the only location that has been stocked (week of March 8), but several lakes with good holdover provide good fishing. The trout stocking season starts up in April (check on-line for a stocking schedule). *Forest Road 300 (Rim Road) to Woods Canyon Lake and Bear Canyon Lake is still closed for the winter. BEAR CANYON LAKE – Inaccessible. Forest Road 300 (the Rim Road) is still closed for the winter as of 3/24/2017. BLACK CANYON LAKE – Fishing is fair. The lake is full and has a new boat ramp. No ice. Accessible on Forest Road 86. Try PowerBait for carryover rainbows. The water is turbid from snow melt runoff and lures/flies likely won’t work well until the water clears a little more. CHEVELON LAKE – Fishing is fair for large wild brown trout and carryover rainbow trout. Forest Road 504 from the north is open, but access from the Rim Road is still closed. The lake is full and has no ice. WILLOW SPRINGS LAKE – Fishing is fair for carryover rainbow trout and tiger trout. The road to the boat ramp is now open and boats can be launched. No ice. WOODS CANYON LAKE – Inaccessible. Forest Road 300 (the Rim Road) is still closed for the winter as of 3/24/2017. No ice. You can walk in from the locked gate just off Hwy 260. FOOL HOLLOW LAKE – Fishing is fair. No ice. Carryover rainbow trout are being caught. The lake is full for the first time in several years. Fishing pier and platforms are accessible! Northern pike are congregating to spawn in the shallow southern portion of the lake. Large catfish were also found in the shallow southern portion during a recent fish population survey. RAINBOW LAKE –Fishing is fair to poor. Lake is full and spilling. No ice. The pike spawn is over and they are dispersing back throughout the lake, but can still be caught with shiny lures. SCOTT RESERVOIR – Fishing is poor. The lake is full and spilling. No ice. SHOW LOW LAKE – Fishing is fair. The lake is nearly full and has no ice. Holdover rainbow trout, and lots of cutthroat trout, should be fishing well. The road over the dam is now open. There is a new restroom and fish cleaning station that will be usable once the electricity is connected. Additional facilities improvements at Show Low Lake will be coming soon. WOODLAND LAKE – Fishing is poor. The lake is full and spilling. No ice. Fishing dock is inaccessible. PATTERSON PONDS – This is a community fishing water in St. John’s. A regular fishing license or a community fishing license is required to fish here. Channel catfish and sunfish fishing is fair, but trout fishing is good. Catfish were last stocked in October and rainbow trout were stocked on January 25! The pond daily bag limits in community fishing waters (2 trout; 2 catfish; 5 sunfish) apply. * Highways 261 and 273 roads are still closed. BECKER LAKE – Fishing is good to excellent. Becker Lake is open to catch-and-release only for trout, artificial fly and lure only; single barbless hooks only. No bait. No trout may be kept. Many large, thick rainbow trout are being caught on white semiseal leach with olive or gray tail, or red chironomids under a strike indicator. Tiger trout are also being caught and an application for State catch-and-release record for tiger trout at Becker Lake was recently submitted. The lake is full. BIG LAKE – The lake is ice free. 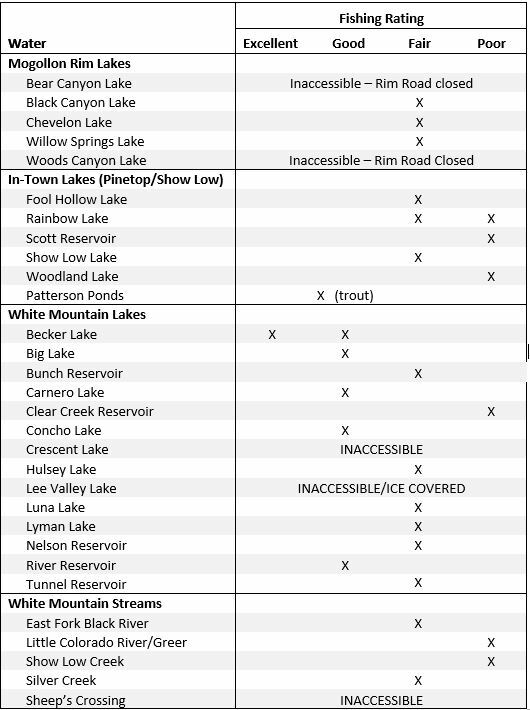 Highways 261 and 273 are still closed for the winter, but you can access the lake legally from Alpine. CARNERO LAKE – The lake is ice free. The route to the lake by way of Forest Road 117 is still blocked by a large snowdrift, but you can reach the lake by way of Forest Road 118. Fish surveys have not yet been conducted, but winter limnological surveys show that there should be no winterkill. The lake is nearly full. CLEAR CREEK RESERVOIR – Fishing is poor for trout, but fair for sunfish, bullheads, and bass. No ice. CONCHO LAKE – Fishing is good. The lake was stocked in early March with trout! CRESCENT LAKE – The lake is ice free, but is still inaccessible. Highways 261 and 273 are still closed for the winter. Winter limnological surveys showed some areas under the ice with high pH levels and other areas with low oxygen, so there was a chance of a partial fish kill. Fish population surveys will be conducted soon to determine if fish have survived the winter. GREER LAKES (River; Tunnel; Bunch) – All 3 lakes are full and ice free. Large holdover brown trout and rainbow trout are being caught in River and Tunnel. HULSEY LAKE – Fishing is fair for holdover rainbow trout. No ice. The road is open and accessible. LEE VALLEY LAKE – Inaccessible and possibly ice covered. Few fish remain here, although we are not predicting a winterkill, since it was not stocked last year. Highways 261 and 273 are still closed for the winter. LUNA LAKE – Fishing is fair. The lake is full and has no ice. Rainbow trout of all sizes are being caught, including some large fish. LYMAN LAKE – Lyman Lake State Park is open. Fishing is fair for bass, walleye, carp and catfish. Use corn or night crawlers for carp and catfish. No ice. NELSON RESERVOIR – Fishing is fair. The lake is full and spilling. No ice. Holdover rainbow trout may have sores from a parasite called Lernaea, however they are safe to eat. The lake will not be stocked until it stops spilling. SILVER CREEK – Fishing is good. A protozoan infection called “Ich” hit rainbow trout in Silver Creek in October, causing significant stress, some mortalities of trout, and poor fishing, however, that bout of infection has passed. Fishing is good in the upper section, but poor to fair in the lower section where more of the mortalities occurred. Current regulations are catch-and-release with artificial flies and lures with single barbless hooks only, but that will change to statewide regulations on April 1 when bait and 6 trout daily limit will apply. The upper section will close to fishing when this regulation changes for the summer season. Harvest of trout in the lower section during the first week of April should be fair, but anglers should be aware that it will not be as great as it was last year. SHEEPS CROSSING/LCR – Inaccessible. Highway 273 is still closed for the winter. See the full March 22 report from Wayne Gustaveson (www.wayneswords.com). LEES FERRY – See the full March 16 fishing report from Lees Ferry Anglers. LAKE HAVASU – Angler Nick S. reported: “Last week I went to Havasu for three days and had a lot of success throwing a dropshot rig. We caught three and lost a bunch more, but all the fish seemed to be up shallow in kind of a pre-spawn phase. We did see some beds but it still seemed a little early for the bass to be spawning. The fish we did catch were on a dropshot rig, fishing a morning dawn Roboworm with a chartreuse tip. The fish you see below were all caught on the reef, right next to Sand Point Marina. The smallmouth was about a pound and a half, the smaller largemouth was 5.6 pounds and the big largemouth was every bit of eight. We had a great time fishing the river and I highly recommend anglers take the opportunity to fish there before it gets too hot. Happy fishing! YUMA AREA PONDS – Trout have returned to the Community lakes Fortuna, Redondo, West Wetlands Pond and Council Ave. Pond in Somerton. See the schedule. ROSE CANYON LAKE – The lake is closed to vehicle access for the winter. Anglers can still access the lake by foot.